The four-time Olympic champion will run his last British track race at the Grand Prix in Birmingham. MO FARAH WILL run his final race as a track athlete in Britain at the Diamond League meeting in Birmingham on 20 August, the organisers announced on Thursday. However, Farah – who warmed up for the worlds with a gritty win in the 3,000m at last Sunday’s Diamond League meet in London — will give it one last hurrah in Birmingham before he turns his focus to road racing, primarily marathons. “I’m really looking forward to what will be my final track race in Britain at the Grand Prix Birmingham on August 20, and I’m sure it will be a day I remember for the rest of my life,” said Farah on the Athletics Weekly website. “I’ve run many great races at the Alexander Stadium over the years, and have a history there, so it’s a fitting venue for my last track race. 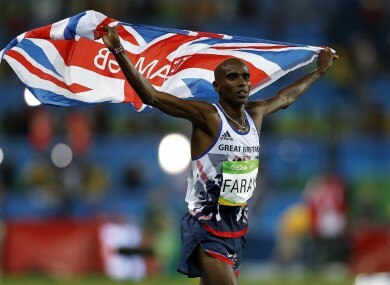 Email “'It will be a day I remember for the rest of my life': Mo Farah announces last British track race”. Feedback on “'It will be a day I remember for the rest of my life': Mo Farah announces last British track race”.